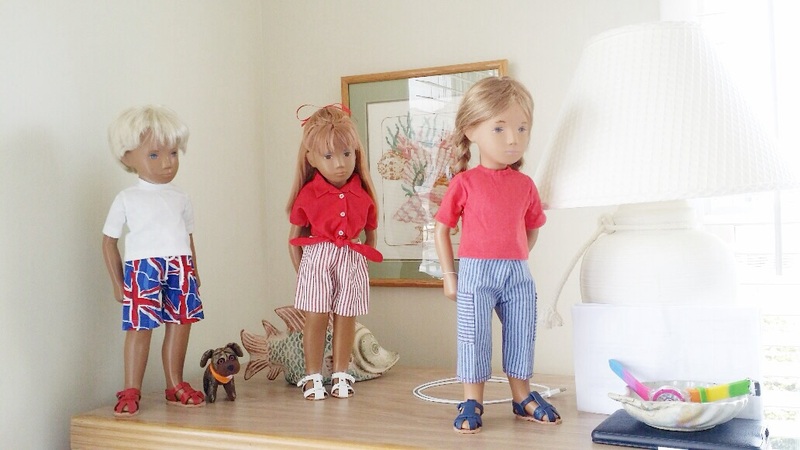 Finn, Pearl and Gertie on Vacation……..Where? 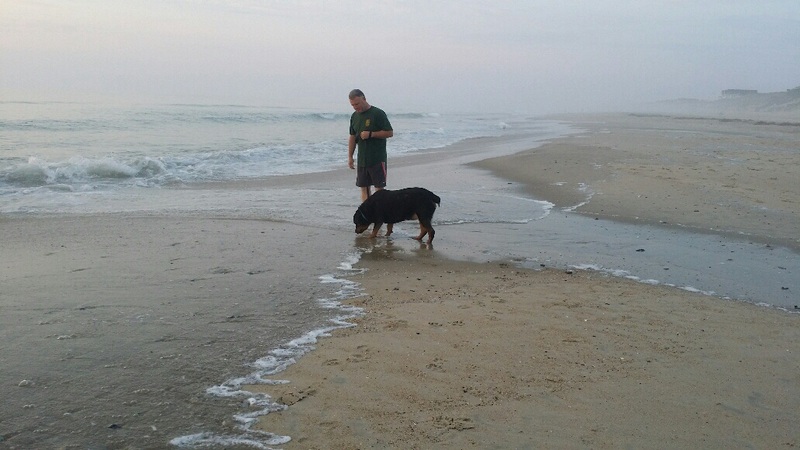 At the beach, Gertie rests with my dear hubby and he is keeping her from getting too much sand in her clothes! 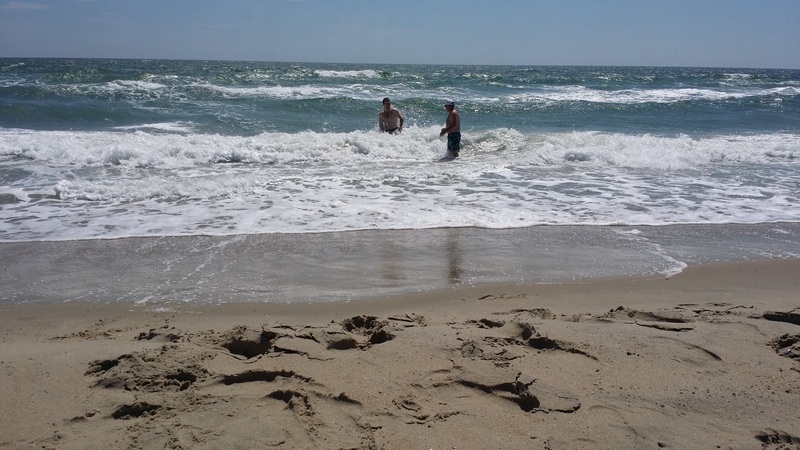 I love the ocean! How lovely to be on vacation ! I love Finn, Gertie and Pearl’s holiday clothes! All looking very chic! 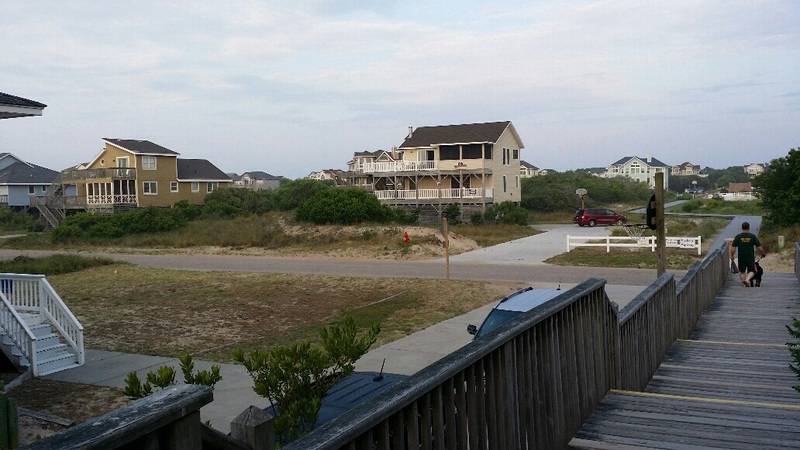 I love seeing the photos of where you all are on the Outer Banks. What an idyllic spot, I can almost hear the waves and smell the air. I really loved the photos of Gertie at the beach, what a lucky girl she is and in such excellent company with Finn and Pearl. Hi Janet! Thank you for the nice comments! 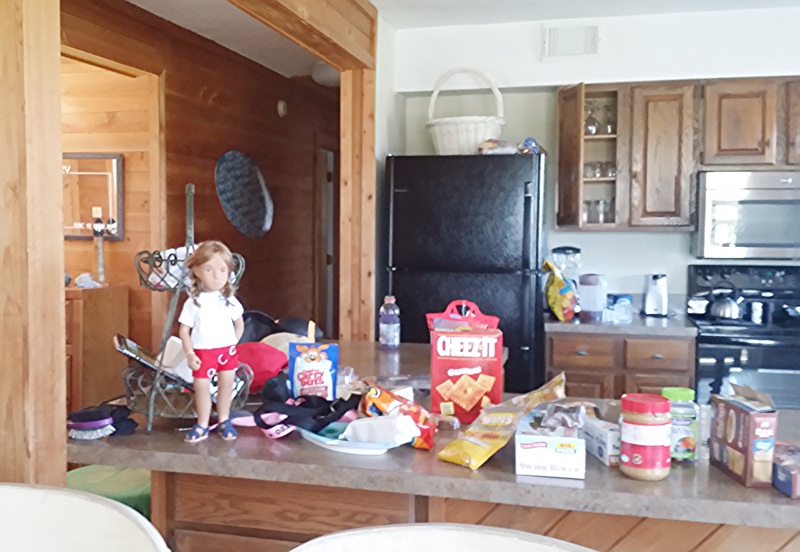 We made it home safely and I thought I should catch up on the blog. 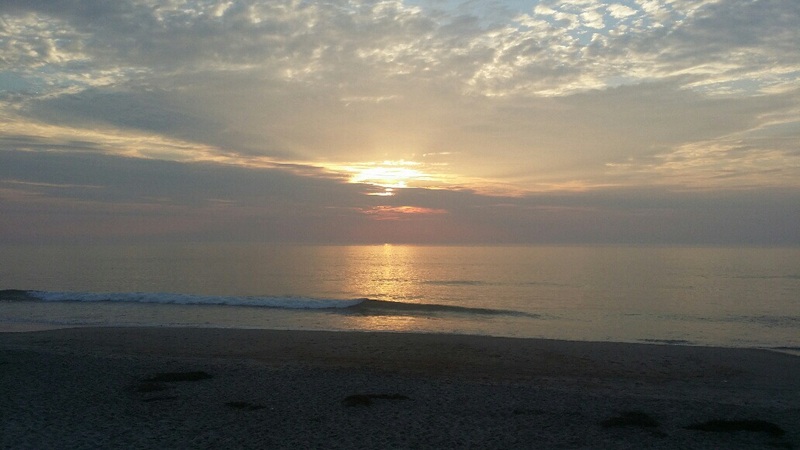 The Outer Banks were so good to us this year! Perfect weather and no one received sunburns which is nice since we are fair skinned and tend to burn easily. ‘My Sasha Brood and I’ SO wish that we were there too as it all looks to be magnificent!! 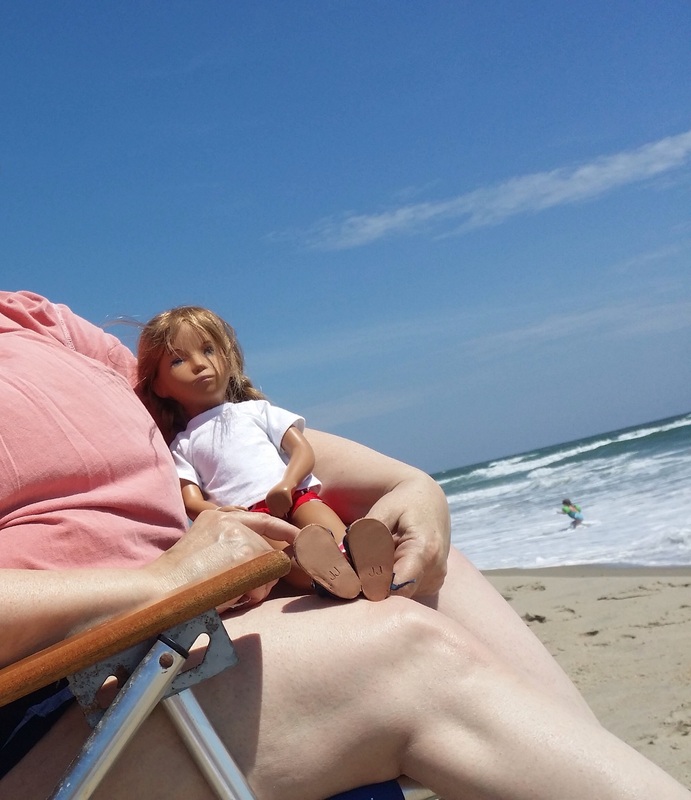 How wonderful to have a holiday house next to the Atlantic Ocean ….although I’d unfortunately have to be under shade (like the Sasha Dolls) for most of the time with suffering from skin Cancer. Must be a real treat though for Finn, Pearl and new Gertie to be there with you. 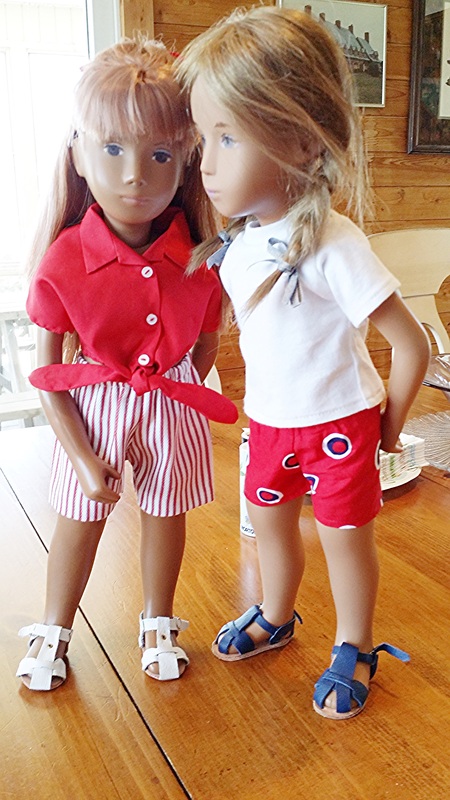 They certainly look perfectly dressed for the holiday in their shorts, tops and JJ sandles. Hope that they have bought their buckets and spades to build some sand castles for us to see and admire. Adore Gertie’s sweet and much younger look here. Her plaits too look so real with those escaping wisps of hair. Pearl, enjoy your turn at the beach tomorrow.. I am so pleased that you enjoy my comments, but honestly the pleasure is mine. It is so nice to know that there is someone who shares my love and joy for these exceptional dolls, who is just a “few hills” away. 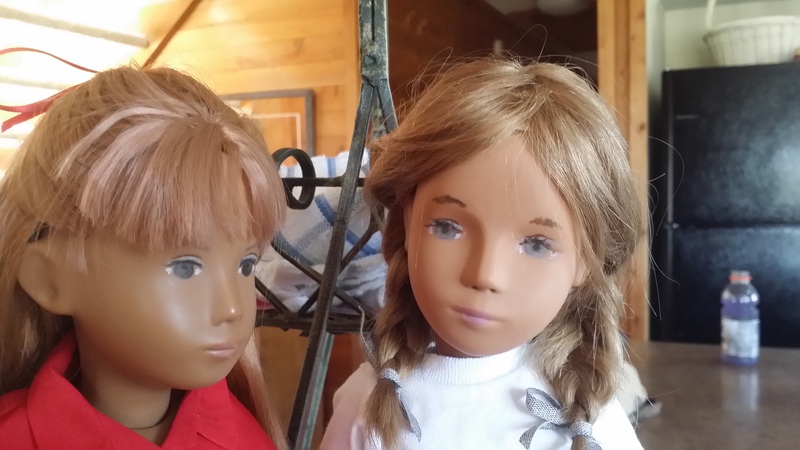 Back in the 90’s when the the new Gotz Sasha’s came out, it was so exciting to learn that yes, you could find the older dolls on Ebay, and that there was a whole world of doll play and clothes out there that I had thought had, (except for the American Girls and Barbie), all but vanished. 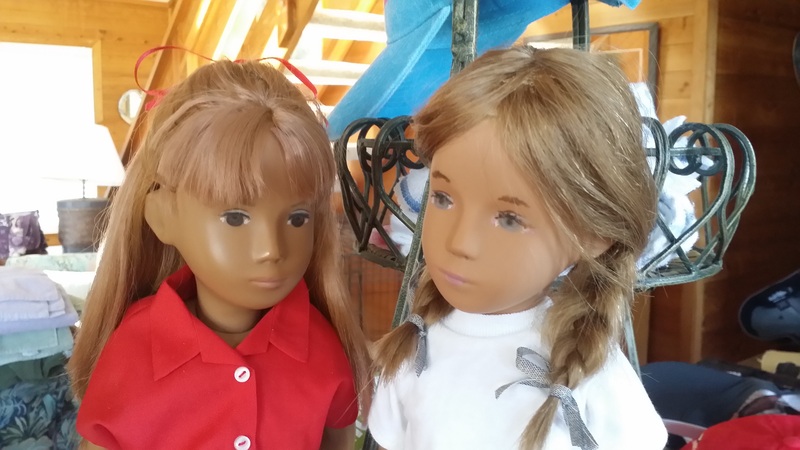 But despite spending way too much money to re-energize my Sasha love, the enjoyment of my wonderful dolls was still an isolated and quiet thing, and though clearly there were others who shared it, we did it alone. In that aspect, I am even more grateful to you, as a casual, one lazy day search under “Sasha dolls,” revealed your wonderful blog to me, and in one exciting fell swoop transported me into a community where my secret play was celebrated in beautiful pictures, happy dolls and doll mothers, and creative stories of imagination and enchantment. So thank you, for showing me a world where we can all share our dolls and their adventures once again. Thank you also for your story about your favorite aunt. Being an aunt myself, it was a lovely thing to hear. 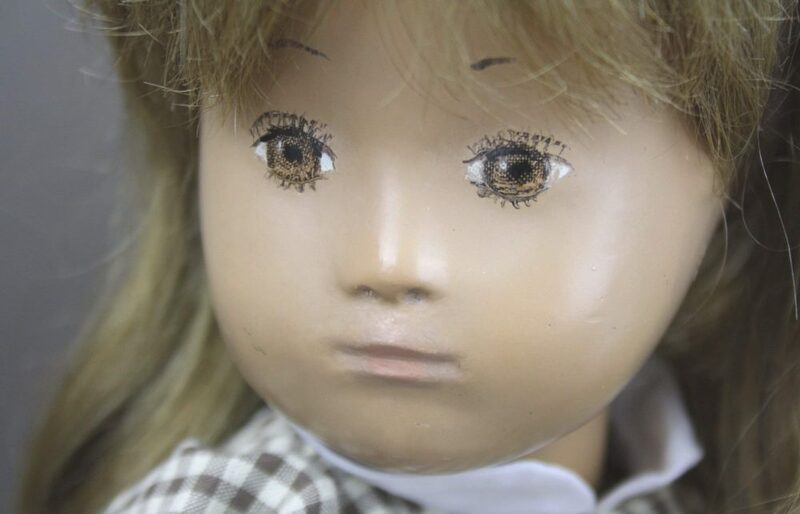 No, I do not mind at all if you wish to call me”Mami.” It is what me, my sister and brother and I called my mother for years, and though most of my doll children seem to like Marmee, there is still a Mami in there now and again. 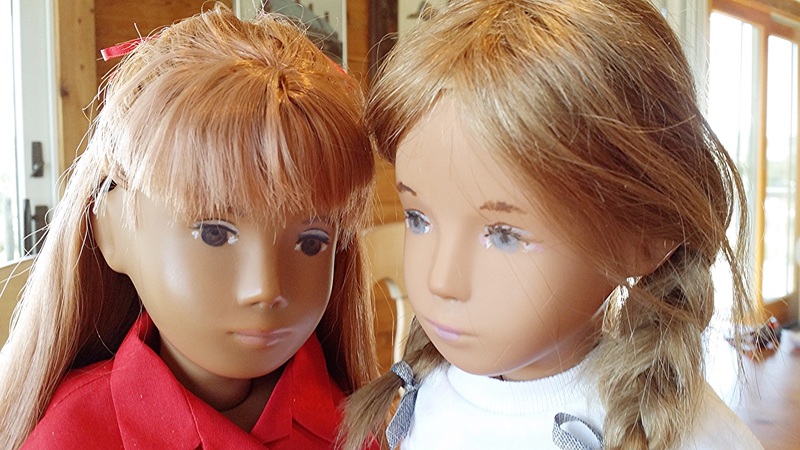 The interesting thing is, that while all the Sasha children have origins in Switzerland, my little Theresa, is the only doll that I actually found and bought in Switzerland, so she is a double Swiss girl, I guess, and to her, Mami is always who I’ll be. On to this post. What a lovely story! And what a wonderful new experience for Gertie! Imagine coming from the towering Alps of Switzerland, to the beautiful blue water and sand of the beach that just stretches out forever, and it seems that your whole family absolutely adores her. I can’t wait for sweet little Pearl to see the Ocean too, or any other sight-seeing that she might be taken on. How very sweet of Finn to help reassure his new sisters and get them into the joys of their exciting new adventure. The holiday clothes that they are all wearing are just adorable. Your cottage looks very nice and cosy, and your photographs are just stunning, only enhanced with the occasional insertion of your lovely Sasha children. They look so happy and peaceful. 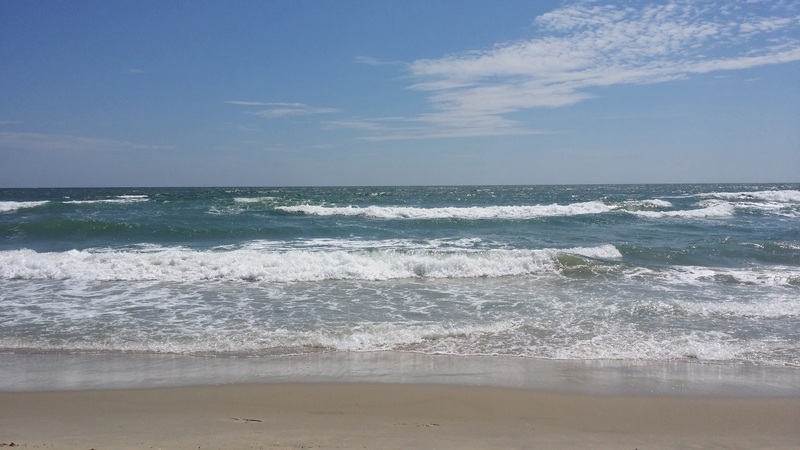 I hope that you all continue to have an amazing and relaxing vacation. Love your blog, Ginger. 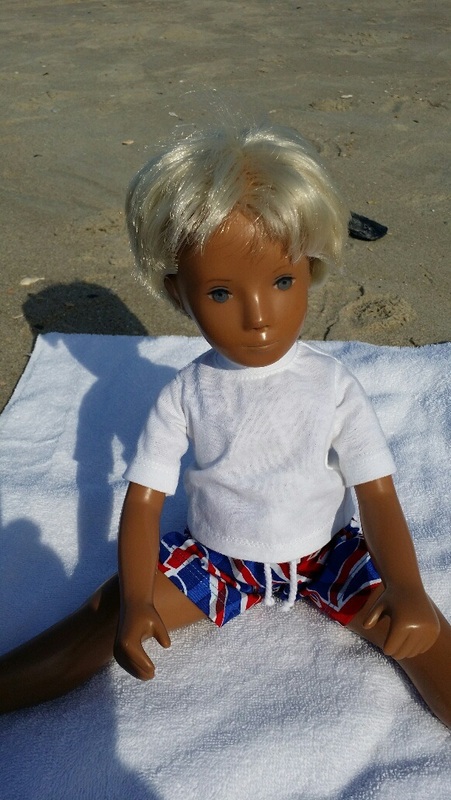 What a wonderful vacation all of you had and I was pleasantly surprised to see Gertie wearing the shorts I made. 🙂 Looking forward to seeing them in their dresses! and to Elisabeth: Lovely story and thank you for sharing!